With reference to the latest market forecast report published by Transparency Market Research, titled 'Marine Ingredients Market: Global Industry Analysis and Opportunity Assessment 2019-2027', revenue generated from the global marine ingredients market is estimated to be valued at around US$ 7,144.9 Mn in 2019, which is projected to increase at a CAGR of 5.3% during the forecast period (2019-2027). The steady growth of the global aquaculture industry is expected to seek higher demand for farm fish feed over the forecast period, creating a prospect for manufacturers to cater to the increasing demand for marine ingredient across the globe over the forecast period. Europe is the primary consumer of marine ingredients and is estimated to contribute around 40.1% value share of marine ingredients over the forecast period, owing to increased penetration of key marine ingredients producers in the market. Moreover, the domestic consumption of fish meal in Canada and the US is relatively low as compared to the fish meal export from these countries. Despite a reduction in the feed inclusion ratio of fish meal in animal feed, the booming aquaculture industry is expected to furnish new business opportunities for fish meal manufacturing companies, especially those which are established in the Atlantic Canadian region, due to the higher availability of fish resources for fish meal production. West African seacoasts are proving to be promising regions for the investment of marine ingredient businesses, due to the presence of rare fish species which are valuable for the production of fish meal and fish oil. The establishment of these industries, in turn, may offer employment to the needy and poor, as unemployment and poverty is one of the major issues Africa is facing. Understanding between industrialists and the locals, and also the availability of plenty of resources, is likely to spur the growth of the marine ingredients market in this region. The European region is extensively engaged in salmon aquaculture. Salmon aquaculture includes the farming and harvesting of salmons for commercial as well as recreational purposes. Marine ingredient specially the fish meal is a primary source of salmon feed, and this converts as an important driver in the growth of the marine ingredients market here. There are many types of fish meal available in Europe - high quality and low quality. Salmon feed requires fish meal pellets which are high in nutrient content. High quality fish meal is relatively expensive, and hence, salmon aquaculture is a major factor in the growth of the marine ingredients market in this region. Rise in demand of halal fish oil is dependent on consumer behavior toward fish oils and healthy foods (fortified), and budding demand for nutraceuticals. Around 20% of world population has Muslims. With major concentration of Muslim population in Middle-East and Africa followed by Asia-Pacific region, there is strong demand for halal foods including halal based fish oil, which is expected to bolster the demand for marine ingredients market over the forecast period. This TMR report contains the current trends that are driving each market segment, and offers detailed insights and analysis into the potential growth of the global marine ingredients market. The last part of the report includes the competitive landscape of numerous market players to provide a comprehensive and comparative dashboard. Major players covered in the report are the dynamic manufacturers who are currently present in the marine ingredients market. 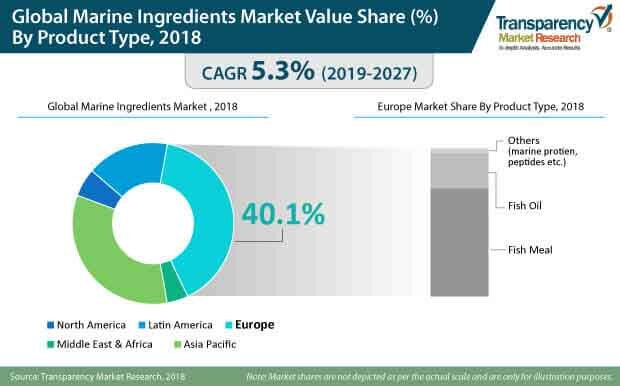 A detailed view of the manufacturers has also been provided in the scope of the report to examine their short- and long-term strategies, recent developments, and key offerings in the marine ingredients market. TMR has profiled the most prominent companies that are active in the global Marine Ingredients market, such as Hofseth BioCare ASA, TripleNine Group A/S, Bio-marine Ingredients Ireland Ltd., SA Copalis, Symrise AG, Scanbio SA, Bio-Oregon Protein, Inc., Cargill Inc., A. Costantino & C. S.P.A., Alaska Protein Recovery LLC., Titan Biotech Limited, Jiangxi Cosen Biochemical Co., Ltd., and Gelita AG among others. Companies are focusing on attaining inorganic growth by acquiring regional and local players. Manufacturers are focusing on improving and establishing direct B2B connections with feed manufacturers. Companies operating in the marine ingredient market are also focusing on expanding their market presence across the globe, and reaching few untapped markets. For the same the companies need to focus on enhancing their production capacity in order to cater to the rising demand for marine ingredients. Also need to offer innovative marine ingredient products with high nutritional content which will help in gaining market share over the forecast period.